Everyone in Cranberry Cove had me pegged as a confirmed bachelor. The identical twin VanVelsen sisters who run Gumdrops were always trying to trick me into revealing something about my love life. Sadly my love life just wasn’t worth talking about. I was fairly content running Book ‘Em—a new and used bookstore where I specialize in mysteries. There are many mystery writers I enjoy reading, but my favorites are the grand dames of the Golden Age—Ngaio Marsh, Dorothy Sayers, Patricia Wentworth and, of course, Agatha Christie. So it was quite a surprise when Monica Albertson showed up in my life. I thought she was attractive—tall and slim with auburn curls—but she’s also level-headed and practical—two qualities that don’t always go hand-in-hand with good looks. We hit it off right away—bonding over our love of mysteries—both in books and a couple of them right here in Cranberry Cove. I never thought I’d get married again, but now I’m getting “hitched” as Bart who owns the butcher shop down the street would say. And you’re invited to our wedding. It’s a simple affair at the Cranberry Cove Yacht Club but we hope you’ll come. 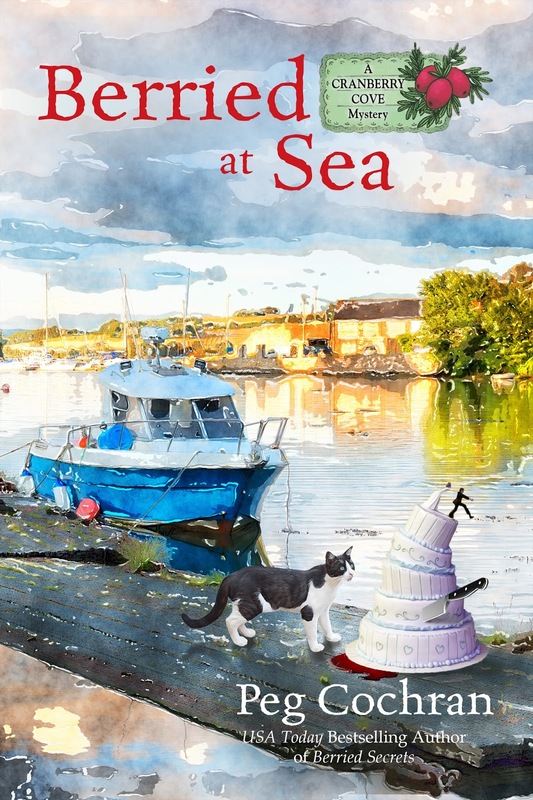 It’s taking place in Berried at Sea which will be available on Amazon by the end of the month! Is there a love in your life? How did you meet? My honey and I were high school sweethearts. He was a year ahead of me but we met in acappella choir. We sang together since I was in the 8th grade but didn't realize we were interested in each other until the night of his graduation. We dated all the while he was in college and then married. The rest, as they say, is history...47 years of it. Geri, that is so romantic! Sometimes you find "the one" early on! My husband of 46 years moved into the apartment right next to mine, and we've been together ever since. I think it was when he plastered his door with autumn leaves that I knew he was the one. Barb, how sweet! My husband's neighbor fixed us up on a blind date and it "stuck." LOL. My husband and I met, of all places, in our office building. I had been working there for a while, and then he and his retired Father opened an office on the same floor. Everyone in the building knew everyone else and it had quite a family atomsphere. It wasn't too long after Bob moved in that the building decided to get us together. The rest is history! A funny story, one day Bob was riding in the elevator, and a man he had never seen before asked him if he was marrying Joe Warren's daughter. He said "yes, Sir," and the man said, "if you ever hurt her, I'll kill you!" We finally figured out that it was one of my Dad's good friends who was an ex-marine! Celia, what a fun story! You just never know when/where you're going to meet someone! Hi Peg. I love this series. My husband and I met when we worked at the same restaurant. Our boss set us up on a blind date. The rest as they say is history. Paula, sometimes blind dates work! It worked for me, too! I love this series. Great to hear the two are getting married. Can't wait to read! My husband had been out canoeing with my brother and a mutual friend. The canoe overturned and they came back to my house to clean up. He indicated he had to leave to get ready for a date and I remember thinking who would want to date him. Then he started calling and showing up a lot. That was 30 years ago and we will have been married 28 years in October. I met my hubby when I was a volunteer at his place of work. We've been married over 35 years. This series sounds great. Eileen, I've often read in advice columns that a great way to meet someone is to volunteer. Sounds like it worked for you!